The singlet and triplet carbene is the topic of Chapter 4, especially sections 1 and 2. The ground state of methylene is the triplet, with one electron in the σ-orbital and one electron in the π-orbital, with the spins aligned. The lowest singlet state places the pair of electrons in the σ-orbital, and this state is about 9 kcal mol-1 higher in energy than the triplet. The next lowest singlet state has one electron in each of the σ- and π-orbitals, with the spins aligned. The singlet state with both electrons in the π-orbital is the highest of these four states, some 60 kcal mol-1 above the ground state triplet. The trick is to find a combination of substituents that will raise the energy of the σ-orbital and lower the energy of the π-orbital. The latter effect can be enhanced if the π-orbital can be a part of an aromatic (6e-) ring. 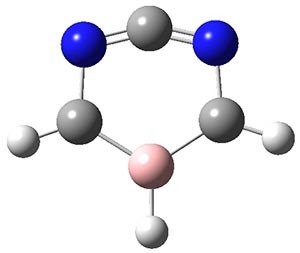 Two of the best possibilities for identifying a ground state 1A1-σ0π2 carbene are 1 and 2. The CASSCF/6-31G(d) optimized geometries of these two are shown in Figure 1. In 1, the nitrogen lone pairs act to destabilize the σ-orbital, while the aldehyde group acts as a withdrawing group to stabilize the π-orbital. The result is that the 1A1-σ0π6 state of 1 is predicted to be about 8 kcal mol-1 more stable than the triplet state, as per CASPT2 and CCSD(T) computations. An ever greater effect is predicted for 2. Here the nitrogen lone pairs adjacent to the carbene act to destabilize the σ-orbital. The empty π-orbital on B lowers the energy of the carbene π-orbital by making it part of the 6-electron aromatic ring. The 1A1-σ0π6 state of 2 is predicted to be about 25 kcal mol-1 more stable than its triplet state! Figure 1. CASSCF/6-31G(d) optimized geometries of the 1A1-σ0π6 states of 1 and 2. 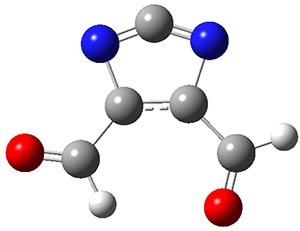 Make the σ0π2 Singlet the Ground State of Carbenes," J. Am. Chem. Soc. 2013, 135, 13954-13964, DOI:10.1021/ja407116e.